One of the things I miss about a local writing group is the discussion about craft. Each writer has his or her own method of writing. The manner in which we get a beginning, a middle and an ending is as unique as the writer. It’s difficult to agree on what makes a book “good” or not but most readers would say it’s an engaging read. Writers would say it’s the ability to tell a story well; it’s the correct ratio of plot, characterization and setting. Even without a local writing group gems about writing can be found in unlikely places. Author readings can include questions that bring these types of responses. And late last week I saw a movie about Jeff Smith that brought me a light bulb moment about my last novel. While looking at the ALA site for Banned Book Week I came across the current Celebrity READ posters in their shop. It reminded me that during high school I had the David Bowie poster hanging on my wall. I don’t recall how I got it. It seems like it should have been a prize for the summer reading club but I was too old for the club then. There used to be an age limit on the reading club though I don’t think they actually said there was – what teenager wants a happy meal coupon for reading books? Now our library has multiple summer reading clubs for kids, teens and adults. Curious about who has been on the posters I found a site called I Love Libraries. It has a page that lists all of the celebrities that have done posters over the years. I learned that we can recommend celebrities and characters for the posters. All you have to do is send an e-mail to graphicsmarketing@ala.org with “READ Poster Suggestion” in the subject line. Bet you can’t guess who I picked for my nomination. Fone Bone from the Jeff Smith Bone series. While looking around I found out there is an author series of posters too where authors recommend some of their favorite books. I’d be interested in knowing if some of them would change their lists. The creator of Strangers in Paradise and Echo was here last Thursday as part of the events surrounding the Jeff Smith exhibit at The Wexner Center. Initially I liked Strangers in Paradise because the women looked real and their story was interesting. I wasn’t really into superheros anymore and had long given up my fantasy that some latent power would surface and make me special. By this point I knew I was special because of who I am. Terry talked about how he went from editing the video work of other people to drawing, writing and self-publishing his own artwork. It wasn’t an easy road but living your dream is rarely easy. He took questions from the audience before signing items and meeting fans. Like most question and answer sessions it was slow to get started but Jeff was there to pitch the first question. Terry is one of the most gracious signers I’ve met or seen in action. He spoke to everyone in line and found something to talk about with each person. If someone asked for a picture he was willing to do that too. I’ve been to some author signings where they’re more focused on signing the book or item than actually meeting with anyone. After the signing a group of us went to dinner at one of the nicer restaurants in town. (You can see me next to Terry or just my hands at the dinner table by going to Jeff’s site.) Good conversation and good food go a long way towards making memories. I’m not always the best conversationalist because sometimes I’ll go into writer mode without realizing it but on this particular evening I wanted to take it all in. For instance, I noticed the sound of the chef’s torch on the maple syrup creme brulee and the toasted marshmallow smell before someone commented on it. And the really funny part? Hearing Jeff and Terry talk about having their story lines set and then veering off in an unexpected direction but having to follow it was just like hearing my writer friends talk about some of their characters and story lines. The only difference is that when the story is published in periodical format (like a comic or a serial story) there is no going back to fix the plot holes. 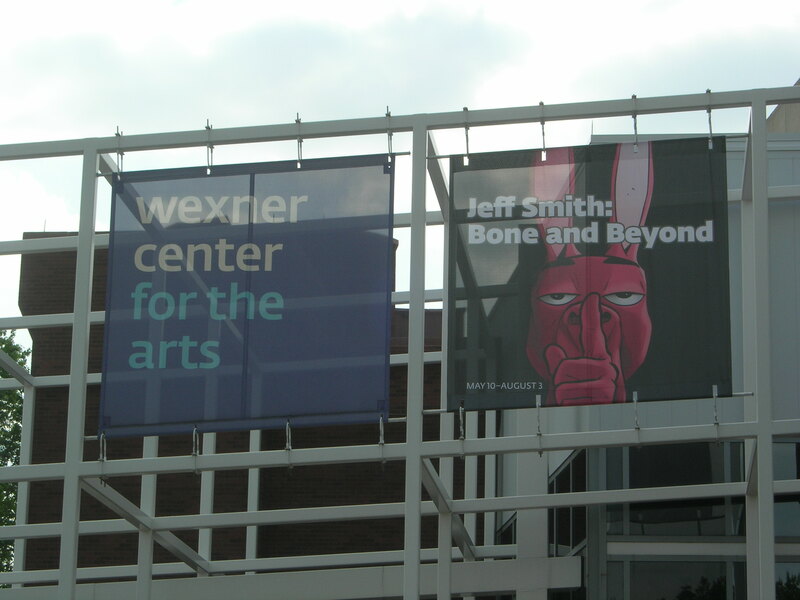 The last few days I’ve been busy at The Wexner Center for the Arts. In conjunction with the Cartoon Research Library, the galleries have an exhibit of his work side-by-side with his influences. Friday evening was opening night and Saturday Jeff sat down with Scott McCloud to talk and then they did signings. Show openings are usually a poor time to look closely at the artwork. People are crowded together to get their first glimpse of how the galleries are setup and to see what was included in the show. I’ve been to a few at The Wexner Center for the Arts but this one was different. Most of the attendees were in their 30’s, the artist was accessible – as were the “celebrity” guests (celebrity is in quotes since not everyone would think of Harvey Pekar, Joyce Brabner, Charles Vess, etc. as celebrities), and several people were running around with cameras taking pictures of everything. The talk was fun – Jeff always seems to have a good time with his audience. It was very obvious that Jeff and Scott always have a good time together. With Bone available now in Scholastic editions the audience has skewed younger than when the comic first began. I was one of the few women attending comic book conventions and going into the comic book stores with regularity. There are more women now but when I looked at the line in front of me for autographs it was mostly parents with their kids. The signing session lasted three and a half hours. The original art in the Cartoon Research Library is interesting to see since it highlights nearly all of the characters from Bone before Jeff figured out that he just had to trust himself and do it the way he wanted. Jeff Smith attended OSU and has donated his papers to them. 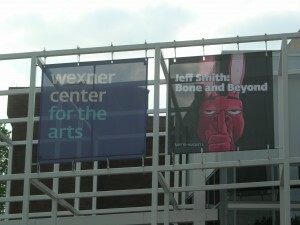 The name of the exhibit in the library is Jeff Smith: Before Bone. In conjunction with the exhibit, a special $25 numbered and signed catalogue is available for purchase. Proceeds directly benefit the library. Only 500 special editions will be printed and nearly all copies were spoken for as of Saturday afternoon. I had older brothers into comics so it was normal to me to pick up a comic book from time to time at an early age. Shortly after our move to Columbus my brothers went on a day trip with an uncle to Hocking Hills and Old Man’s Cave. I was upset I couldn’t go – I wanted to do everything they did even though they were eight and ten years older than me. I was even more upset when Jim told me they were able to see the Dwarfs and Hobbits that lived there. At the time, I believed fairies and other magical creatures lived in the woods; they just weren’t discovered by the entire human population yet. Fast forward over a decade later to when I’m making bi-weekly trips to the comic book store with my then-boyfriend (yes – I married him!) and we discover this new comic about three Bone creatures who get run out of Boneville and find themselves in a magical placed called Old Man’s Cave. Populated by some fantastic and improbable people and creatures, how could I not become a little girl again with each issue?